Custom engrave metal coins and tokens with your design and copy, or choose from our 100+ stock designs. These metal coins and tokens are available in six different finishes: Anodized Aluminum, Antique Bronze, Antique Silver, Goldine, Nickel-Silver, and Natural Aluminum. Our minimum order is only 250 coins (1000 for aluminum). Volume Discounts are available. Delivery time is approximately four weeks (allow six weeks for Silver). 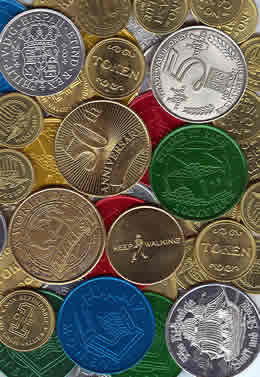 Metal Coins and Tokens can be used for bar drink tokens, commemorative coins and awards, Mardi Gras, parades, games, mailings, and giveaways.